About twenty inches long. Large black head and black back with iridescent green tinge. The remainder is white. A white patch on each side between the eyes and the bill. Goldeneyes inhabit the northern regions throughout the Northern Hemisphere. The Common Goldeneye nests in the northern U.S., southern Alaska and most of Canada and winters throughout Canada and as far south as California, Texas, Florida, Mexico and the Caribbean. 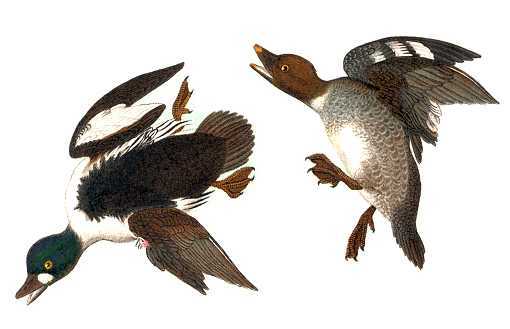 In Europe, Goldeneyes migrate south passing through Switzerland to Italy. Tolerates cold weather well being driven only by frozen water. Migrates in small flocks sometimes with other duck species. Wings produce a rhythmic whistling in flight; otherwise a silent bird. Dives for fish, frogs, shell fish and tender plant roots and seeds. Also eats insects. Excellent swimmers, spending most of their time in the water except to nest when their poor walking abilities are revealed. They look comical, walking in a jerky motion slapping their huge webbed feet their wings extended often falling over if hurried. Makes nests of grass, leaves and moss, lined with down in deep cavities of decaying trees near rivers and fresh water lakes. Lays six to twelve ashy green eggs which hatch after about a month of incubation. Ducklings are led to water at a very young age and fly at about two months age. The Common Goldeneye Nest Box has a 12″ by 12″ floor, 22″ inside floor to ceiling, 5″ wide by 4″ high entrance hole located 19″ above the floor (to the top of the hole) and ventilation openings in the floor and under the roof.